Thanksgiving is my absolute favorite season. There’s nothing that brings me more joy than cooking in the kitchen and putting just-made platters of food on the table to share with family and friends. You can tell by this ginormous smile on my face! I go all out for Thanksgiving. I love to put in all the extra effort – planning guests lists, going through stacks of recipes to organize the perfect menu, and prepping and cooking in the kitchen for days. But even with all the intense preparation, I love short cuts! 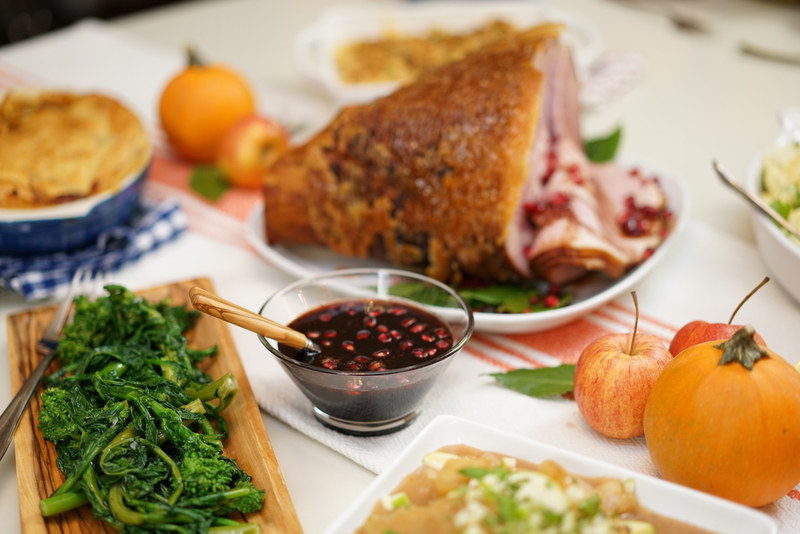 For #Friendsgiving this year, I have partnered with HoneyBaked to share with you for the very first time some of my secrets to getting holiday sides on the table – quickly and with some style. 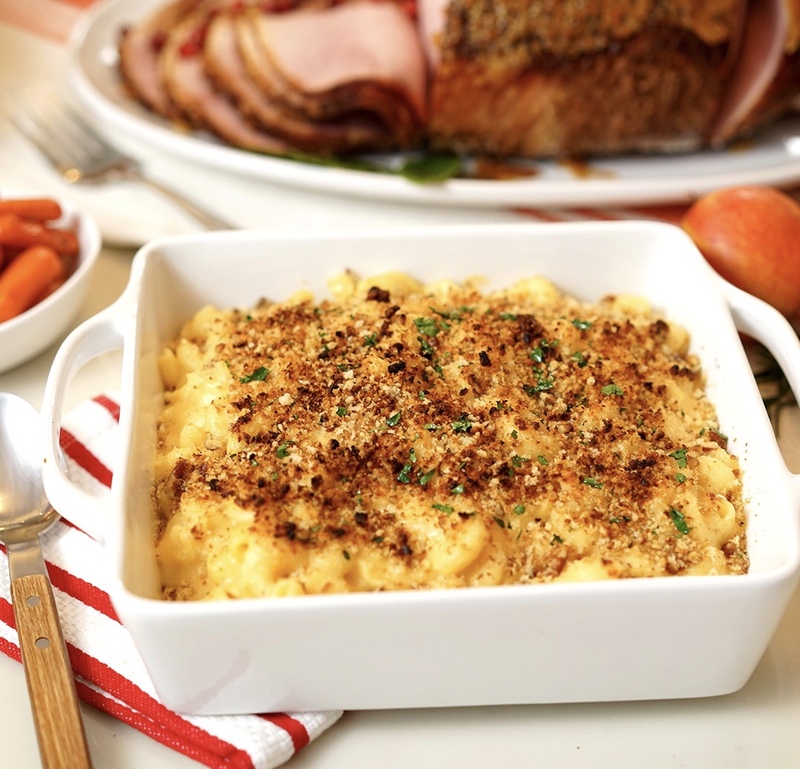 I have chosen my favorites of HoneyBaked’s new Heat and Serve Side Dishes, like the Double Cheddar Macaroni and Cheese and Maple Sweet Potato Soufflé, and added a few twists to make them my own and look a bit fancy for the holiday. My shortcuts will for sure save you time. They use minimal ingredients found in everyday grocery stores and basic tools that can be found in pretty much every kitchen. Hopefully, they will make you feel a bit like a pro while cooking - even if you usually just make scrambled eggs or spaghetti. And while I do have you heating up HoneyBaked’s Side Dishes in a sauce pot, the heating instructions on the packages work just fine, too. Most importantly, though, my tricks will make the friends you care most about feel extra special this #Friendsgiving, which is what matters most. Here are four ways to “whomp up” some of HoneyBaked’s new side dishes – with a bonus recipe that I have served alongside Honey Baked Hams for years. All centered on a brown sugar crusted, spiral-sliced Honey Baked Bone-In or Honey Baked Boneless Ham, which is the #Friendsgiving go-to. Have a Lovely & Delicious Friendsgiving! When it comes to entertaining, salsa bought in the deli section of the grocery store has been my secret weapon for years. Like champagne, I always have at least two options in the refrigerator at my fingertips. The 16-ounce pint containers are the perfect size for most recipes, and the fresh ingredient varieties save at least 5-10 minutes of washing or chopping, which is SO convenient! My usual salsa "go-to" recipe, especially this time of year, is my Grilled Avocados. People flip out when they learn even the hardest avocados bought at the grocery store can be grilled in 7-10 minutes and transformed into delicious persona-sized "guac and chips" with salsa spooned over top. It's a party hit every time. Since May is National Salsa Month, I decided to push myself past the grilled avocados recipe and give myself a "Chopped" salsa challenge. I wanted to see what cool, clever ways I could take salsa and turn it into new family favorites and dinner party crowd pleasers. I had a lot of fun with this salsa challenge and learned quite a bit in the process. Mainly, I discovered that there are way more varieties of fresh salsas at the grocery store than I thought. More than the traditional restaurant style salsas we tend to reach for, there are many roasted tomato, garlic and pepper versions, several made with fruit, such as peaches, strawberries or even mangoes, like my new favorite Garden Fresh Gourmet Mango Salsa (yum! ), and an abundance of creative varieties using artichoke, black beans and tomatillos. With these options to play with, my creativity in the kitchen was pushed beyond what I expected. And that's a good thing! For gazpacho, fresh is the most important flavor. During the summertime, I especially crave the gazpacho I first tasted in Spain – made with juicy ripe tomatoes, sharp onions and sweet peppers along with chunks of freshly baked bread, roasted bits of almond and smoky paprika. To re-create this delicious Spanish-style version, I use restaurant style salsa for the base and then "whoozge it up" in the blender along with high quality extra virgin olive oil, roasted almonds, Spanish sherry vinegar and fresh, crusty pieces of baguette from the bakery. It comes together quickly and is finished off with diced, crisp cucumber and drizzles of olive oil. Salsa and chips are a crowd favorite anytime. So why not turn them into a homey, satisfying breakfast casserole the whole family will devour? For this recipe, I take a cue from Spanish tortas, playfully using tortilla chips instead of thin layers of potatoes, then folding in a generous cup or more of tomato-y salsa. The trick is to let the chips soak up a bit of the egg mixture to ensure the casserole is rich and "egg-y." This is one of those dishes that once you get the hang of it, it can be made freestyle, adding in personal twists according to your tastes and likes. I never thought to take salsa and turn into a drink, but now I'm scratching my head as to why not? It's a darn great idea! Using salsa as a cocktail base is a clever trick to get drinks ready quickly for brunch or a special family gathering. This recipe takes a fruit-based salsa and turns it into refreshing, modern bloody marys with smoky mezcal and mango juice. It's a fun and welcomed twist from the traditional tomato-based versions. The best thing yet…a pitcher is ready for guests in less than 10 minutes. That's a party! This rustic salad is easy in preparation, yet big and complex in flavor. The bitey taste of fresh, raw tomatillos is balanced and mellowed by an avocado "verde" salsa, making this non-traditional panzanella salad exciting to eat and pretty to look at on the plate. Champagne vinegar adds brightness to the flavor, too, along with a good handful of fresh parsley leaves. For added depth and a bit of crunch, the bread cubes can be toasted in the oven first before putting the salad together. Fresh Express has new organic salad kits in grocery stores nationwide, and they're pretty delicious and fun - especially the new mix-ins, like the crispy quinoa and crunchy pita chips. The kits are ideal for on-the-go to work or an individual meal at home. They're also great quick starters to get a complete dinner on the table fast. Food & lifestyle expert Chadwick Boyd recently got creative with the new Fresh Express Pomegranate Cranberry kit taking it one step further to make a great tasting family dinner using pomegranate juice and a pork tenderloin. 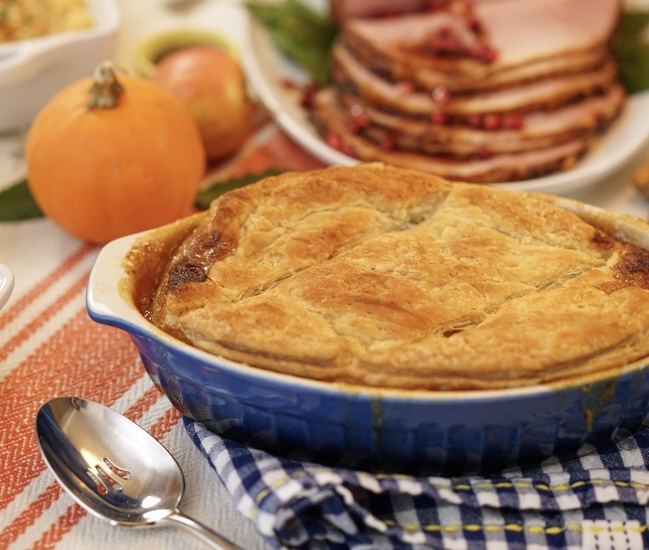 Watch Chadwick make the dinner step-by-step to easily create at home. All that is needed are a few additional ingredients and a few minutes of prep and cooking time to transform the kit into a dinner that kids and parents will dive into. Chadwick gives some entertaining tips, too, to use the pomegranate cranberry kit to wow guests at a dinner party. The new Fresh Express organic salad kits can be found in most supermarkets around the country. To find more details and get more inspirations, go to freshexpress.com. Hit LIKE on the Fresh Express Facebook page to watch Chadwick make more meals with the new kits. There's no such thing as a typical day in the life of NYC- and Atlanta-based food and lifestyle expert Chadwick Boyd. Recently, Chadwick sat down with Southern Living's Anna Aguillard to chat about his new Recipe Collection, "Entertaining with Vegetables," his farmer and Southern roots, his commitment to working with large-scale consumer brands to make better products for home cooks, and eating smoked and grilled cicadas - yes, that's right. Check out the feature on SouthernLiving.com now: Chadwick Boyd on His New Recipe Collection, His Nana & the Weird Things He's Cooked. Food & Lifestyle Expert Chadwick Boyd Hosts New Food Short Series “Reel Food” for Screenvision Media on Movie Screens Nationwide through Oct. 15. Food and lifestyle expert and TV host Chadwick Boyd hosts an innovative new food short series, "Reel Food," launching in theaters today. The specialized content was created and executive produced by Screenvision Media's in-house content studio 40 Foot Solutions, with production strategy provided by media specialists Gail Yancosek Consulting. The segment is the first installment of Screenvision Media's "Reel Content" original lifestyle programming and will run nationally within its 14,000 screen network during the Front + Center preshow. "I am thrilled to be part of a groundbreaking new venture to bring food, flavor and fun to millions of movie lovers across the country," says Boyd. "As a film buff myself, it's really cool to be able to create and share recipes and kitchen tips inspired by current movies that entertain people before the show and motivate them to get into their kitchens at home," Boyd added. Food & lifestyle expert Chadwick Boyd shows TODAY Show fans "3 Ways to Use Veggies and Herbs in Your Home Decor" in the HOME section of Today.com. Boyd provides fun, easy and inexpensive ways to use vegetables and herbs from the produce department, like radishes, chard, Italian parsley and more, to decorate the kitchen or dinner table. Check out his vegetable floral arrangements that can be made for under $20 - and can be eaten for lunch or dinner after the party. He also shows how to use herbs to create a breathtaking tablescape that easily saves $50-$80 from the florist. The Produce Mom® and food and lifestyle expert Chadwick Boyd have joined forces to provide recipe development and photography services to U.S. produce brands and their marketing teams. The new business offering gives produce marketers access to deep industry expertise and nationally recognized talent to create magazine-quality content that appeals to modern families and Millennials. images that showcase fresh fruits and vegetables in easy, modern ways and get moms and dads excited about being in the kitchen," says Lori Taylor, CEO and owner of The Produce Mom. "Content these days is a premium, especially because social media, like Pinterest and Facebook, play such a large role in influencing what families buy at the grocery store." How-to, storage and entertaining tips are also included, depending on the nature of the content. Packages start at $11,500 and include concepting, recipe testing, writing, art directing, food and prop styling, and photography. For a limited time only, new clients will receive special promotion across the Chadwick Boyd social media channels to support their campaigns, which reaches national media and consumers. Food & lifestyle expert and author of "Entertaining with Vegetables" Chadwick Boyd favors simple tricks and techniques in the kitchen to make vegetables exciting - and easy - for home cooks. Food52 Managing Editor Kenzi Wilbur fell in love with Boyd's simple and elegant Shaved Broccoli With Soft Feta and Golden Raisins and shared it along with a few of her own little twists on Food52.com. Get Boyd's recipe and Wilbur's added suggestions: https://food52.com/recipes/61674-shaved-broccoli-stalk-salad-with-soft-feta-golden-raisins. Food & lifestyle expert Chadwick Boyd shares a simple technique in his cooking classes and events that people love - shaving broccoli stalks. It's a low cost, high value technique that transforms broccoli...and saves grocery bill money that's usually thrown away. Check out Chadwick's broccoli stalk tips and how-to in the Huffington Post. A delicious dinner recipe is included that any home cook can make. Read "Shave & Save: Broccoli Stalks Are Your Best Friday to Keep Pennies in Your Pocket." Food and lifestyle expert Chadwick Boyd celebrates "Making the Most of the Summer Bounty" with the co-hosts of Food Network's The Kitchen. He makes Radish and Snap Pea Bites with Brown Butter Rosemary Drizzle with Marcela Valladolid, Sunny Anderson and Katie Lee, and gives summer entertaining tips from his new Recipe Collection, "Entertaining with Vegetables." Chadwick also helps Geoffrey Zakarian whip up a "Pina Perfected" cocktail. Watch here now. Chadwick Boyd Makes Radish and Snap Pea Bites on Food Network's The Kitchen from Chadwick Boyd on Vimeo. The crew from California Bountiful TV came to the Josie's Organics home ranch to talk with CEO and third generation farmer, Rod Braga, about how he and his family are continuing to grow the business while maintaining the same standards for quality, integrity and sustainability set by his grandparents. California Bountiful also caught up with Josie's Organics food and lifestyle expert Chadwick Boyd in the ranch kitchen to find out how he is working with the Braga family to help home cooks extend the quality and care put into growing Josie's Organics vegetables all the way to the dinner table. Through tips and recipes based on "whole vegetable cooking," Chadwick shows how families can easily use all parts of vegetables, from the leaves, bulbs and skins, in every meal. WATCH. Josie's Organics, one of the nation's premium organic vegetable producers, expanded its recipe collection today, adding five new dishes that help moms mix up the weekly family repertoire with easy, go-to meals. The new recipes, created by food and lifestyle expert Chadwick Boyd, showcase fennel, leeks and dandelion greens, which were added to the Josie's Organics whole vegetable product line earlier this year, as well as celery, kale, collards and cauliflower. An Asian-inspired quick dish that cooks in less than 10 minutes, helping to get dinner on the table fast. The warm, crunchy celery and caramelized fennel are enhanced simply with honey and rice wine vinegar – a sweet and sour combo that adults and kids both love. A simple, make-ahead salad made extra special by slicing kale very thinly with a sharp knife and roasting fresh oranges. Sesame seeds toasted lightly combined with gluten-free tamari give it a nutty, Asian flair. It doubles for an easy supper and an on-the-go lunch the next day. a homey, weekend family supper and a super fast, weeknight pasta dinner. These biscuits are foolproof for all levels of cooks, and while cauliflower is the star, biscuit lovers of all ages call them blue ribbon winners. Flecks of fresh leeks mixed with crispy bits of bacon and sharp cheddar cheese make them complete comfort food. They're also freezer-friendly, and easy to carry to picnics, or take to school or church functions. A tasty, quick-fired fusion of Vietnamese dipping sauce with Southern-rooted collards and peanuts. This side dish cooks in under 8 minutes. All that is required is a tilt of the pan, a large spoon and the flip of a wrist. Can be served as a big, family-style bowl or alongside grilled chicken thighs, pork chops or shrimp. TV host and food writer Chadwick Boyd writes about cooking and life lessons through cast iron in a personal essay on TheKitchn.com. "Everything I Know About Cooking I Learned from a Cast Iron Pan," chronicles Chadwick's early years of learning how to cook from the "Better Crocker Boys and Girls Cook Book" using cast iron: frying, sautéing, roasting, baking and more. And then shares the four lessons he has learned about cooking and life today. It's a worthy read for cast iron lovers, novice cooks and those long in the food industry who share a special connection to the reasons why they are in food. Food & lifestyle expert Chadwick Boyd has teamed up with Lori Taylor of The Produce Mom® for the Midwest leg of his 15-city, national "Entertaining with Vegetables" tour. Boyd and Taylor will appear at the Williams-Sonoma Kenwood Towne Center store in Cincinnati, Ohio and Williams-Sonoma Fashion Mall at Keystone in Indianapolis this week from 6:45-7:45 p.m. ET. The events show modern moms how to turn accessible fresh vegetables from the produce department into easy, delicious dishes for weeknight dinners or all-occasion entertaining. The live cooking show includes promotion of broccoli, chard, artichokes and more with giveaways to attendees. Boyd will sell and sign his newly-released Recipe Collection, "Entertaining with Vegetables" with foreword written by James-Beard winning author and home cook champion Nathalie Dupree. The Collection is currently only available for purchase on the tour. For more details on the partnership, go here. Chadwick Boyd begins a national book tour with his new recipe collection Entertaining With Vegetables this Friday, March 18. The kick-off takes place in Newark, Delaware where his mom lives, where he went to high school, at the Williams-Sonoma store in Christiana Mall in "where [he] went when [he] was an 80's kid in whitewashed jeans." The tour will visit 15 or more cities in 2016. SFA founding member Nathalie Dupree wrote the foreword for the collection, and Boyd will donate 10% of its proceeds to the SFA's Nathalie Dupree Graduate Fellow program, which offers tuition assistance and a modest stipend to two graduate students each year in exchange for work with our organization. Both Boyd and Dupree have long been champions for home cooks; they share a passion for getting ordinary people into the kitchen and helping them feel good about what they cook. If dessert and a make-ahead appetizer sound like way too much for the effort, you might want to think about it again. Food and lifestyle expert Chadwick Boyd stopped by the new show, "Coffee with America," to get in the kitchen with host Ebony Steele to make his Grilled Pears with Cardamom Honey and Grilled Pear and Curly Parsley Crostini. Both dishes only take 10-15 minutes to do from prep to serve. How simple is that? The trick with the dessert is to choose slightly firm California pears at the produce department and a fragrant, rich honey, like an orange blossom or sourwood honey, to make the complementing honey cardamom sauce. The appetizer is very easy, too. Slice and grill up one firm pear, too. Then drizzle with honey and olive oil. The surprise is adding fresh bits of Josie's Organics curly parsley - they give a wonderful fresh bitter flavor to the natural sweetness of the pear and honey. If you don't have time to toast up your own crostini, Breton crackers work beautifully. WATCH the clip. Chadwick Boyd's "Ode to Celery" in Serious Eats "The Comfort Food Diaries"
When it comes to vegetables, celery is my star (no joke). So I wrote about my deep love for the crunchy, yellow-green, watery sweet vegetable for Serious Eats in the January series "The Comfort Food Diaries." My love affair with celery began one night several years ago at a corner table at Gabrielle Hamilton's restaurant Prune in NYC's East Village. My devotion to it deepened one September day last year when I stepped foot for the very first time in a celery field on Rodney Braga's family farm in Soledad, California. It's been a culinary kismet that Julia Child would be proud of. Read the full story. There is great demand for organic vegetables these days. So much so, grocery stores are moving toward produce sections that are all organic rather than a mix of conventional and organically-grown. That's exciting for home cooks everywhere. With this expanded access to healthy, great tasting vegetables comes an even more exciting shift in food: whole vegetable cooking, or using all parts of vegetables…skins, stalks, leaves…in the kitchen. Chefs have led the whole vegetable cooking movement for a while – just look at the cookbooks from Steven Satterfield, Hugh Acheson and April Bloomfield. It's just now starting to take root at home in everyday America. "Many people still cut off the florets of broccoli and pitch the stalks, but the stalks are so sweet and tender," explains home cooking expert Chadwick Boyd. "By using every bit of our vegetables, family dinners, lunches and snacks become so much more fun and delicious," Chadwick adds. To take the whole veg plunge at home, here are five easy tips to get started - http://josiesorganics.com/tips-to-go-whole-veg-at-home. For easy cooking motivation, here's a simple recipe that uses every part of broccoli, including the beautiful green leaves: Shaved Broccoli Stalk Salad with Soft Feta and Golden Raisins. When Southern pastry chef Lisa Donovan comes to New York City, you gather all your food writing and biscuit loving friends and invite them over STAT. "That's exactly what I did," said Chadwick Boyd. "I have marveled at Lisa's ease and grace especially while biscuit-making. I wanted to gather as many people in the city as I could to see her handiwork. It's simply magical." On one of the hottest days in June, more than 20 food journalists and enthusiasts gathered in the L&D Test Kitchen to watch Lisa apply her soft Southern touch to self-rising flour and share her story-like way with baking. Lisa said baking mainly relies on touch, smell and intuition. "Intuitive baking is easy to learn," Donovan said. "Understanding your ingredients is huge. Learn the temperament of your ingredients. All ingredients have characteristics. If you know them, you'll be fine." For more of Lisa's tips on how to make the perfect biscuit along with her delicious Black Pepper Buttermilk Biscuit recipe, check out Jeff O'Heir's story in Yahoo! Food. When Redbook's editorial team called and asked food and lifestyle expert (and self professed organic veggie champion) Chadwick Boyd for simple tips and recipes to help readers get on the #wholevegcooking bandwagon, he happily shared some of his Josie's Organics favorites: Beet and Beef Kebabs with Beet Greens, Rainbow Chard Parmesan Tart and Roasted Radishes and Radish Tops with Rosemary Brown Butter. To get the genius hacks for using every part of the vegetable in the kitchen, go to redbookmag.com.